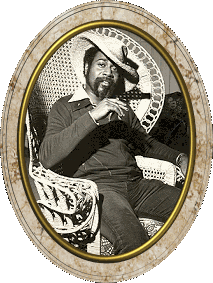 Charlie Smalls Composer of "The Wiz"
Harry Belefonte - Tour Paris & Stockholm - Late "60's"
Film "Faces" - Performer & Composer (Theme) - Late "60's"
Grammy Award - 1975-1976 Best Cast Show Album "The Wiz" Tony Award 1975 Best Score (Lyrics) Musical Play "The Wiz" Tony Award 1975 Best Score (Music) Musical Play "The Wiz" Drama Desk Award - Outstanding Achievement 1974-1975(Music & Lyrics) "The Wiz". 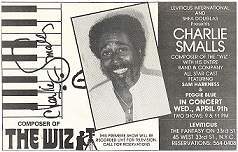 Show Of The Month (Music & Lyrics) "The Wiz"
CHARLIE SMALLS, the man who bagged a Tony -- on his first toss -- for the score of "The Wiz," turned out, on meeting him in person at the pool of the Beverly Hills Hotel, to be as robust and irresistible as his music. Only slightly less irresistible were the bagels, lox and stuffed eggs we couldn't help but notice on the cabana table. "You're right," Smalls chuckled, "they're not on the menu. I've been out here for a month, and I couldn't take it any more. I'm homesick. I went out and found a deli this morning and brought them in." For a total unknown to come out of nowhere and win a Tony was, to say the least, unusual. Where, we asked, had he been all his life? "Studying. Learning," Smalls said quickly. "Since I was 3 years old, my life has been music. When the other kids were out playing ball, Charlie was practicing. Can you believe I still don't know how to play baseball?" he laughed. We wondered if three wasn't a little young to begin, even for a genius. "Maybe. 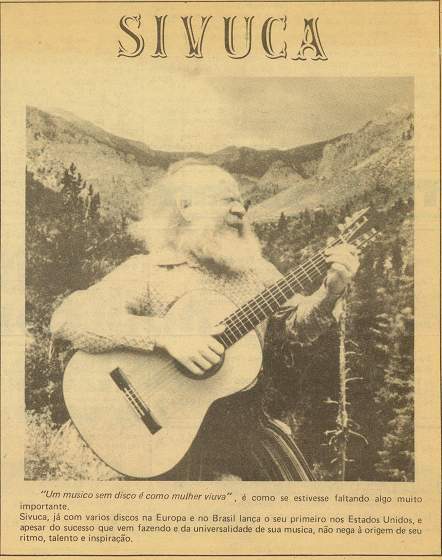 My mother had studied music. She didn't want me to be a musician because they didn't make enough money -- so she locked the piano practically as soon as I could walk." Smalls laughed. "It didn't work. I was a hellion even then. I found a hammer and broke the lock, and from that time on, she couldn't drag me away from that piano. Finally," he went on, "she told me, 'Okay, if that's really what you want' -- so I started music lessons. I went on to 14 years at Julliard, and I loved every day of it." wasn't so good before it got turned into a song. I'd take a bad thing and make a song out of it. I've made the bad experience work for me and turn it to good. I also turned it into money, and that's productive, too." He tapped his foot to the tape deck and leaned forward. "It took me three years to finish the score. I'd start work at 11:30 at night, when everybody else went to bed. I had to reach a certain level of energy -- plug into the cycle of music that's going on all the time in the heavens." He pointed, grinning at our politely confused countenance. "It's touching a moment from outer space -- a creative moment -- and whatever comes, maybe lyrics first, maybe music, that's what you put down." We nodded uncertainly. "If you're not ready for it when it hits," Smalls continued, "it's gone. It can take you three months to get it back. You know, I feel I was born to create music. When all the neighborhood kids were auditioning for 'West Side Story', I remember saying to myself, 'Charlie, you don't want to play in that -- you want to write it.'" Where, we asked, do you go from instant and total success? "Who knows? I've got a lot more music in me. As it is, they took two of my favorite songs out of the show because they needed time. The problem is, I started out at so high a level, I'll really have to break my brains to top it. Suddenly," he went on, "I'm in the 50 per cent tax bracket, and I didn't even know there was one." What, we wanted to know, did he do for fun? "I have fun, that's all. I am fun, man. Once you learn how to live on $5 a week -- and have a good time -- when you do get the money, then it's all fun." We asked him, finally, to sing one of his songs for us. He started, his rich baritone almost at a whisper, "Now that I know that I wasn't born yesterday -- that I'm full-grown -- I can stand on my own -- nothing's going to get in my way. 'Cause I know I'm going to make it this time..."
Up on the roof of a 12-story cooperative apartment house on West 105th Street between West End Avenue and Broadway are four clusters of huge aluminum plates and, most days, an anxious army of tenants and technicians. The plates, angled south to catch the sun's warmest rays and hooked up to an elaborate maze of pipes, pumps, and valves, are the most visible signs of an energy consciousness-raising experiment that makes the 67 year-old building one of the largest in the city try heating its water with solar power. If all goes well, the co-op will save 10 to 15 percent of its fuel bill next year- $4,500 to $7,000 - while managing to supply hot water to the beauty salon and six shops that rent space facing Broadway. The shiny solar collectors will also satisfy the tenants' own needs for hot water in their kitchens and in the basement laundry room. Like hundreds of other pre-World War II buildings in New York City, the co-op was heating its water inefficiently, especially during the summer. The sponsors of Sun Day - the celebration of solar energy that will be held next week - point to such solar experiments as proof that comparatively efficient solar energy is leaving the gimmick stage and becoming a recognized tool in saving energy. The Sun Day organizers have great hopes, as do the tenants in the building, with its spacious living spaces and grand views of the Upper West Side. So does Consumer Action Now, which provided technical assistance in drawing the plans and seeking grants from the Department of Housing and Urban Development. Final tests of the solar system will be completed soon, and guided tours of the building will be given during the Sun Day observance next week. So far, preliminary tests have shown that the plumbing beneath the system will have to be modified a bit to handle extra heat, since solar collectors are catching more heat than expected. "I'm nervous because we're not sure what the payback will be," said Arthur Weinstein, treasurer of the co-op's board of directors, who volunteered the building for the experiment. Mr. Weinstein, a lawyer who specializes in co-op problems, said his building may become a model for inner-city housing that could be converted to solar energy and made profitable again. He added, however, that the Government has not introduced enough incentives to make solar equipment an attractive alternative to builders and designers. Solar supporters claim this has restricted solar equipment to fewer than 40,000 buildings in the United States; in Japan, more than two million buildings have solar systems, and in Israel 20 percent of all homes harness sun power. heavy initial costs of solar energy." The biggest shock was that we may have spent as much on pipes from the roof to the basement as we saved on doing a large project," Mr. Napoli said. For heating, the sun's rays are absorbed by 117 flat collector plates, which are glass-covered, black-painted aluminum and are mounted in four arrays that rest on jungle-gym-like superstructures that cost $9,000 apiece. The contraption was welded to steel skeleton of the building after installation crew consulted the 1911 architect's drawings and punched a few holes in the roof. Finding nothing, the foreman brought in a mine detector, which was a bit more accurate. "Everybody who sees is has a moment of awe when they first get up there," Mr. Weinstein said, "Tenants have called me after midnight a couple of times to ask if I would show off the roof to guests at their parties. The heat from the collectors is piped to the basement by water circulated beneath the plates. Part of the heat is used immediately, while part is stored for later use. In the winter, an antifreeze mixture will be substituted for water in the pipes. The plumbing runs down the back stairwell, between the 18-inch-thick floors, and into the subbasement, where the heat exchanger has replaced the ancient coal bin. The co-op calculates the system will deliver water hotter than 150 degrees in the summer, 90 degrees in the winter. City law requires water 120 degrees at the tap. If it's cooler than that leaving the basement, it will be routed through the old oil-fired water heater. But Mr. Weinstein said that this arrangement would still save energy, since the water heater won't have to raise the temperature by as much. Martha McAndrew, president of the co-op board, said that a few residents have made some less than sunny comments about the conversion, although the majority of the 64 families have been "amazingly enthusiastic." There are worries about all the cloudy days and whether that means cold showers," she said. "We have to explain that to shareholders and explain that we have a back-up system to store heat for days like that. While the West End Avenue installation is a novelty in the neighborhood, the use of solar energy is at least 1,000 years old. As the tenants there discovered, solar technology is fairly simple, but the equipment to collect and save such radiation can be sophisticated. "It's tougher to heat the water in this building than it is to heat a swimming pool in Scarsdale," Mr. Weinstein said. "We have complicated plumbing up there, dozens of feet of pipes and valves, and because of its sensitivity we're being far more conservative in our estimates of what it can produce." Mr. Weinstein said he would not have bothered with the conversion if the grant had not come through. And Harold Krane, whose firm, Thermodynamics Inc., was the general contractor on the West End Avenue retrofitting, said the most useful solar package is a single family home, not a building as big as the co-op. The building is 18 to 24 years away from recovering its investment, he said, but smaller solar installations are cheaper. Instead, Mr. Weinstein said, what many older buildings need most are thermopane windows that will keep heat from leaking. "We're sitting here with 1911 windows. We need capital for loans we could easily repay. There is just no need for us to heat the sky over New York."